Makrand Gupta, VP of hardware partnerships at Wearhacks, announced this list at our August 27 meetup. Wearhacks is a global non-profit dedicated to making hardware as accessible and affordable to hackers as possible. In keeping with GYBO’s 2015 theme, Makrand shared some of the health-related projects that came out of Wearhacks’s 2014 hackathon in Montreal, such as a glove that senses a patient’s heartbeat and a belt that helps the visually impaired navigate their environment. At #GYBO2015, each team of participants will receive a standard kit that includes either an Arduino Uno or a Raspberry Pi, motors, sensors, and LED lights, and there will be fabrication materials like foam core to work with as well. 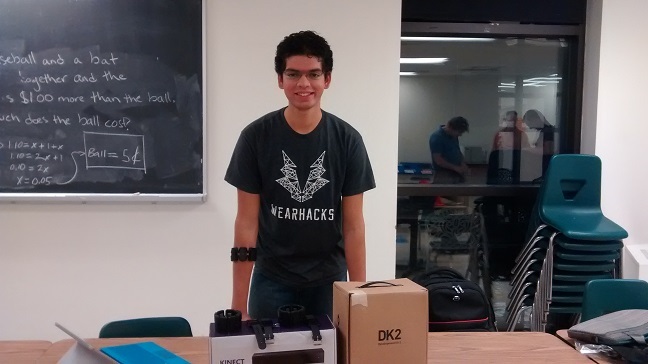 The equipment on loan from Wearhacks can be connected to the Arduino as input/output devices. Remember, your bot has to receive input or sense the environment in some way. Find out about the other exciting hardware that will be available to use at GYBO on our blog, and don’t forget to register for the hackathon if you haven’t already! The deadline has been extended to September 3, midnight.